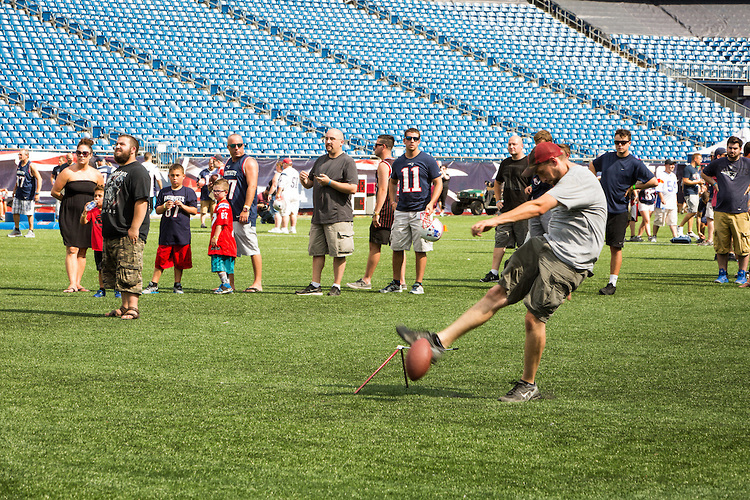 A couple of weekends ago, DraftKings invited us to check out their first-ever Fantasy Sports Fest, held at Gillette Stadium. 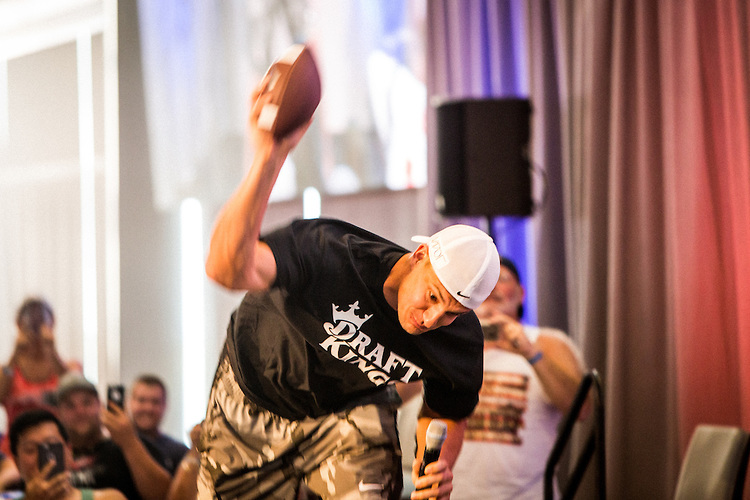 The event was a draw for Pats fans and avid fantasy players alike, with appearances by Gronk and ESPN's Trey Wingo and Matthew Berry. The duo provided expert fantasy tips to the crowd, and Gronk participated in a fan Q&A, where he spoke on everything from Tom Brady's avocado ice cream to his favorite touchdown celebrations. Arriving at the event, it was clear that everyone was excited to get on the field at Gillette and have their Patriots drill experience. Walking the halls, you could feel the buzz of the attendees around us while they entertained themselves with the many activities and photo opportunities. 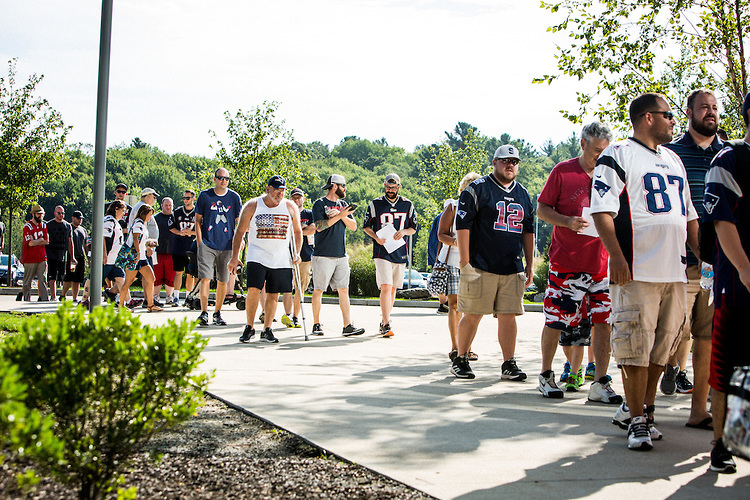 From former Patriots players to a shiny Lombardi trophy on display (complete with security) to Cheerleaders, silent auctions and plenty of tailgate games – there was no expense spared when it came to entertainment. But all of this was just build up to the main event, time on the field. The first stop was the quarterback station where a man named Tex organized the group into pairs for practicing their throwing. Incrementally he would have the groups taking steps back, coaching them into throwing just a bit further. By greeting us all with individual first bumps, we were immediately placed into the mindset of the team and the positivity of the event. From the quarterback station we moved on to the DB drills station where our agility was tested with a series of rapid paced drills.Our coach here ran it more like a formalized practice, calling for ten push-ups if you dropped the ball. This mentality proved to be very popular, with the group appreciating the challenge and feeling like real athletes. There were even cheerleaders there for support. The next stop was the 40-yard dash, which was exactly what you’d expect. People lined up to try their hardest – and try their hardest they did. From 6 year olds to middle-aged fans, everyone seemed delighted to try and make a decent score. One participant even boasted that he beat Brady’s 5.28 second time. Through all of this though, the crowd favorite seemed to be the Field Goal challenge stop. Even those who hung back through other challenges seemed excited to try their best to kick. We had former players coaching us through, helping us learn when to extend and where to kick the ball. Confession here, I have to say that this stop was not my strong suit. Last but definitely not least, we visited my favorite stations the Highlight Reel – Featuring the Gronk Spike. This Homage to that morning’s featured guest was preceded by a series of side shuffles and then tackling a moving wheel. Tackling the rolling wheel proved to be great fun and truly made you feel like you might be ready to join the Pats on the field. After all of these drills, which exhausted in the heat we were escorted back to the Draft Kings Fantasy Sport Zone at Gillette Stadium. Here much appreciated refreshments were provided while surrounded by TV’s showing the NE-NO game, the other Fantasy Fest participants on the field, and Patriots training camp. We were also provided a special viewing section of Training Camp that allowed us to be less than a stone’s throw away from the players as they left the field. This was the perfect endcap to an exhausting, but thrilling day. This post is sponsored by DraftKings. All opinions are my own.